This page explains the settings for final rounds. There are many ways to customize playback to your needs, e.g. the order of the dances, the number of rounds and groups, the length of dances and breaks, etc. Check the paragraphs below for detailed descriptions of the individual settings. 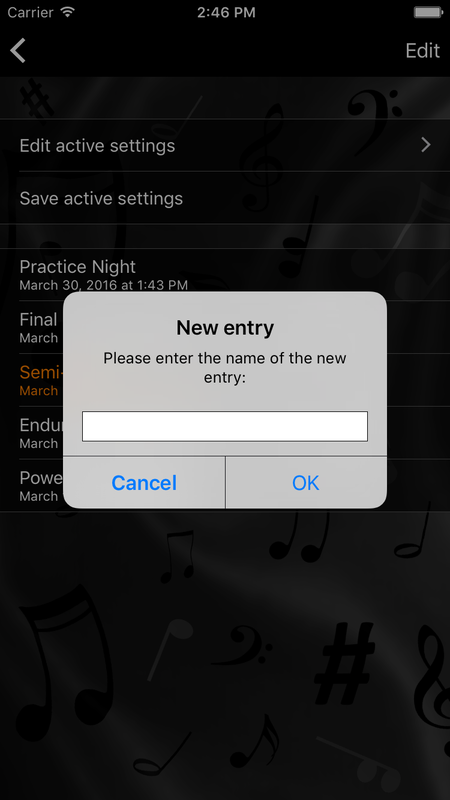 If you are looking for information about basic settings, the music library or the basic player, please visit the Basics page. There are many different occasions for final round practice with different requirements (e.g. 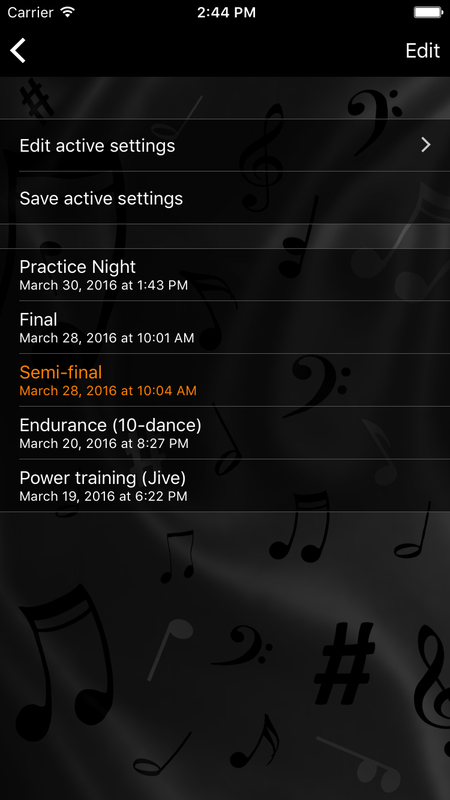 preparations for a competition, endurance training, practice nights, workshops) and even more ways to customize the final rounds played by OnTheFloor. To make it easy for you to switch between configurations OnTheFloor allows you to save your settings, give them an arbitrary name, manually order your list of saved settings according to your needs and, of course, reload them whenever you need them. 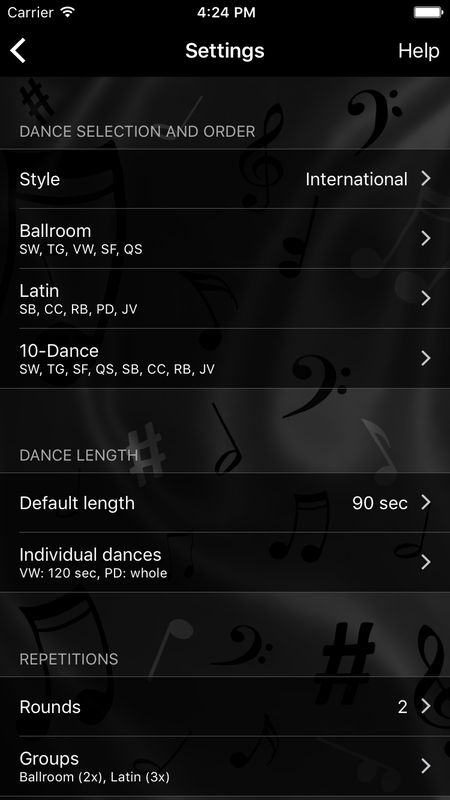 Tap one of the sections to select which dances should be included in the final round and in which order they should be played. You can include or exclude dances by tapping them. To change the order, tap the Edit button at the top right and move the dances up or down by using the drag handles on the right side. To switch between International and American style, tap on the Style setting at the very top. Please note that some of your songs may not be suitable for final rounds depending on your other settings. This can happen when you set the dance length so high that some songs aren't long enough. 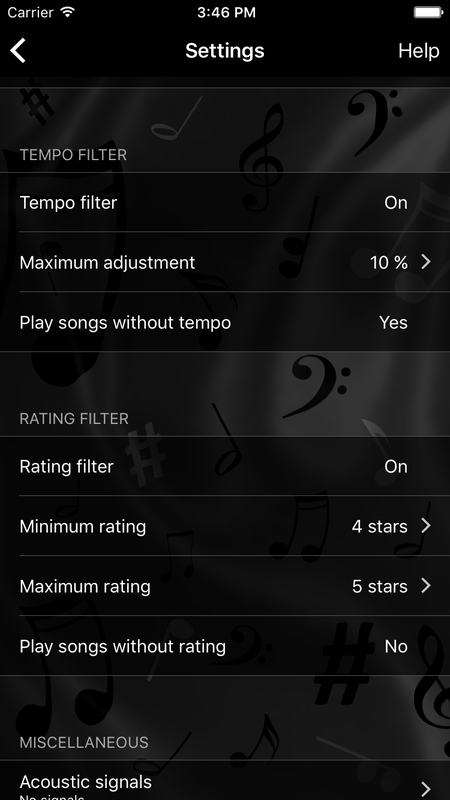 It can also happen when you enable the tempo (or rating) filter and make it filter out all songs without tempo information (or rating). 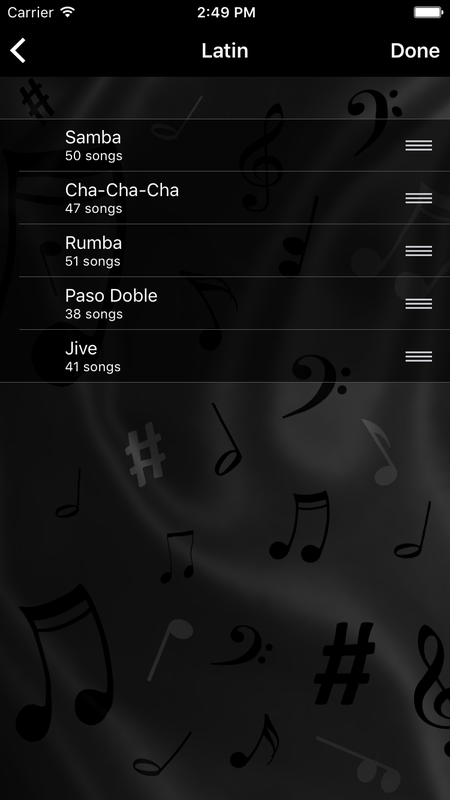 When you tap a section you can see on the following screen how many songs there are for each dance and if some of them are unsuitable. If all songs for one dance are unsuitable the dance is enclosed in brackets. Default length is the default duration of each dance during the final round. Individual dances allows you to select differing lengths for individual dances. Rounds lets you define how many final rounds should be played. 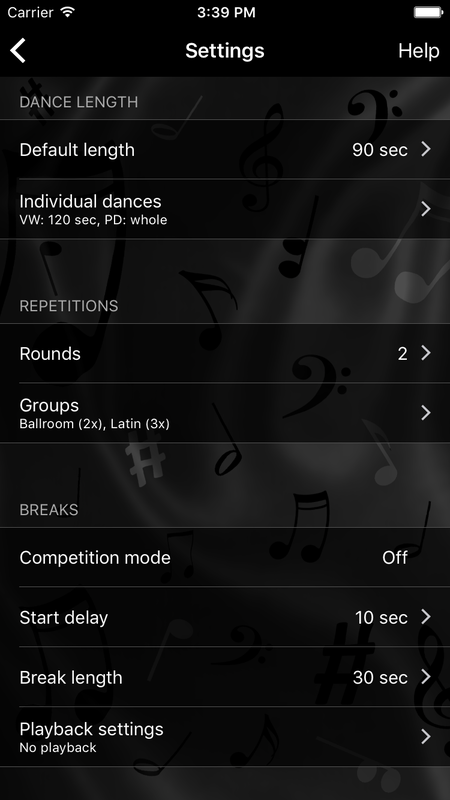 Groups can be used to play each dance multiple times back-to-back. The breaks between repetitions of the same dance are as long as between different dances. Competition mode changes the way breaks are handled by the player. When this setting is enabled the player will wait for you to manually start the next dance by tapping the screen. Breaks will therefore not end automatically after a certain amount of time, but when you want them to (e.g. when all couples are on the floor and ready). While waiting the player will show the time since the beginning of the break. Start delay determines the number of seconds before the first dance begins after you have started the final round. This is to give you enough time to get ready after tapping the screen. Break length is the duration of the break between two dances (or between the last dance of one round and the first dance of the next one). 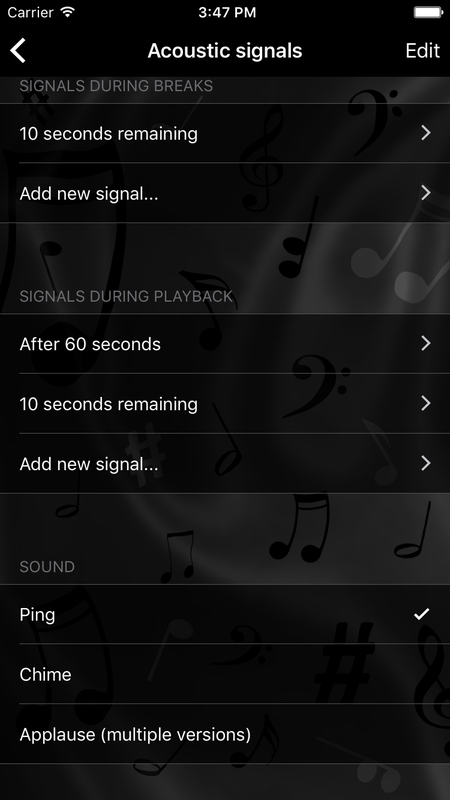 Playback settings control playback during breaks, e.g. to simulate announcements of the tournament director. Tempo filter determines whether the tempo filter should be turned on during final rounds. Maximum adjustment tells OnTheFloor how much a song's tempo may be adjusted to be in the respective tempo range. 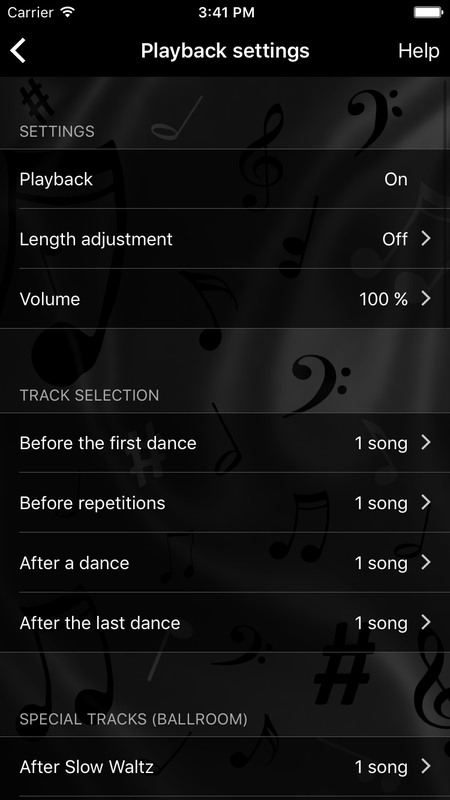 If the necessary adjustment is higher than this setting the song will not be selected for playback. 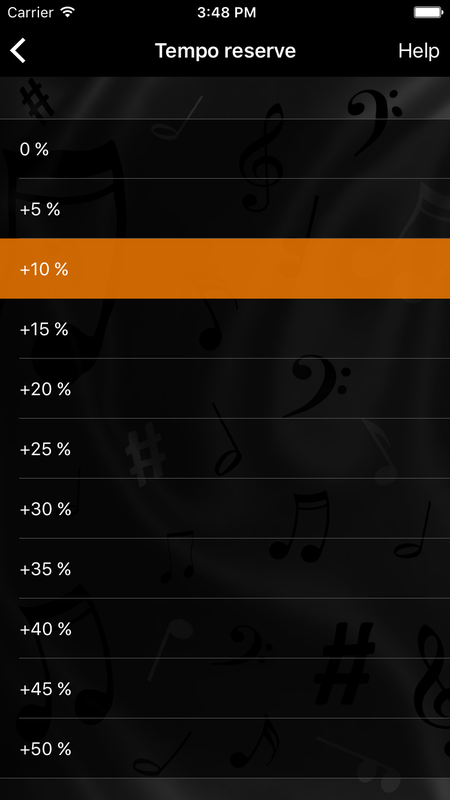 If the song's tempo is out of range, but the necessary adjustment is lower than this setting, the tempo will be automatically changed to be in the specified range. 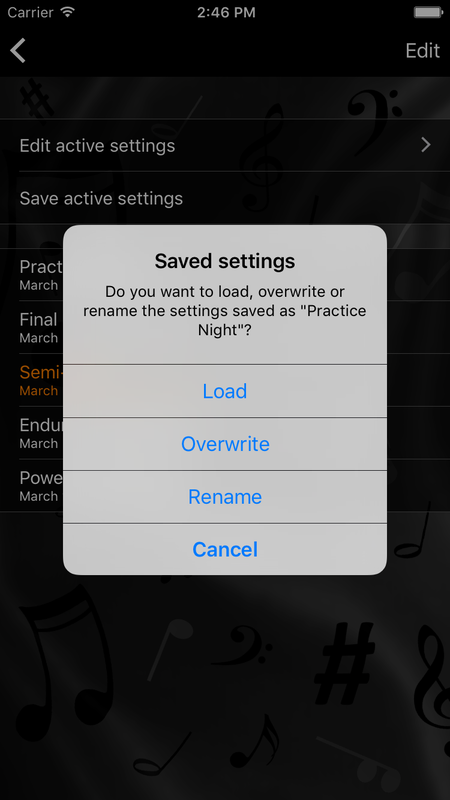 If you only want to filter your songs, but not change their tempo, set this to 0 %. Play songs without tempo determines whether songs without tempo values should be played when the tempo filter is turned on. Rating filter determines whether the rating filter should be turned on during final rounds. 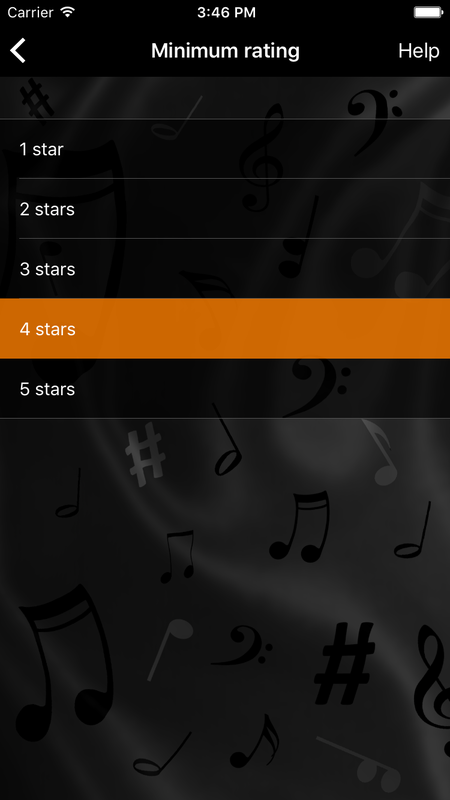 Minimum rating defines the minimum number of stars a song must have to be included in the final round. Maximum rating defines the maximum number of stars a song may have to be included in the final round. 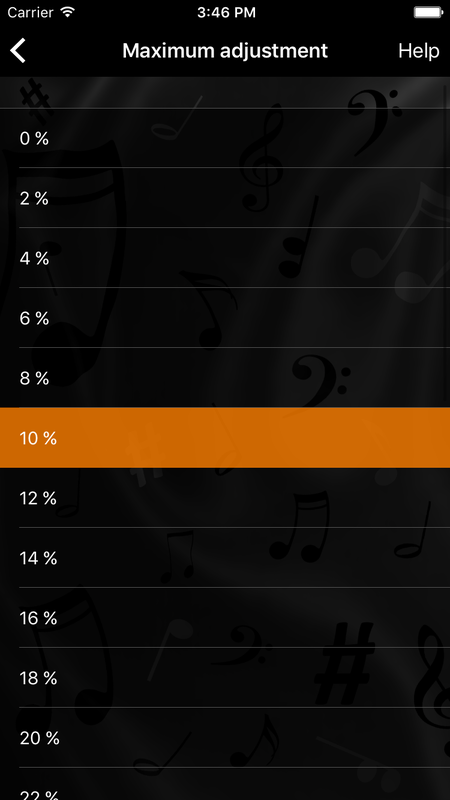 Play songs without rating determines whether songs without ratings should be played when the rating filter is turned on. Acoustic signals are sounds that can be played at certain times during playback or breaks, e.g. to let you know that the break will end in 10 seconds. Skip beginning is the right setting for you if you don't want to hear the same parts of your songs again and again. 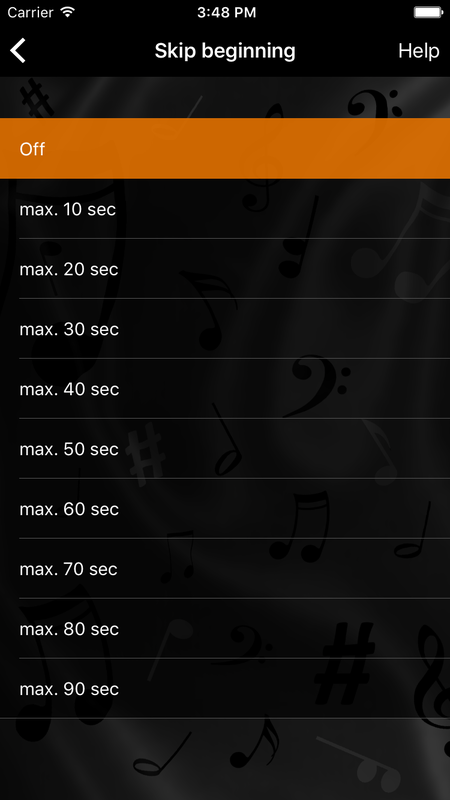 It tells the player that it may skip a certain amount of seconds at the beginning of each song. Within this limit the player will then randomly choose which part of the song it will play. This setting only applies to dances and not to songs played in breaks. Here's an example: If you select max. 60 sec the player will skip between 0 and 60 seconds of each dance. The number of skipped seconds will thereby be different for every single dance. Tempo reserve: When creating playlists for final rounds OnTheFloor only chooses songs which are long enough for the selected dance length. But when you increase the tempo during the final round some songs might still be too short. 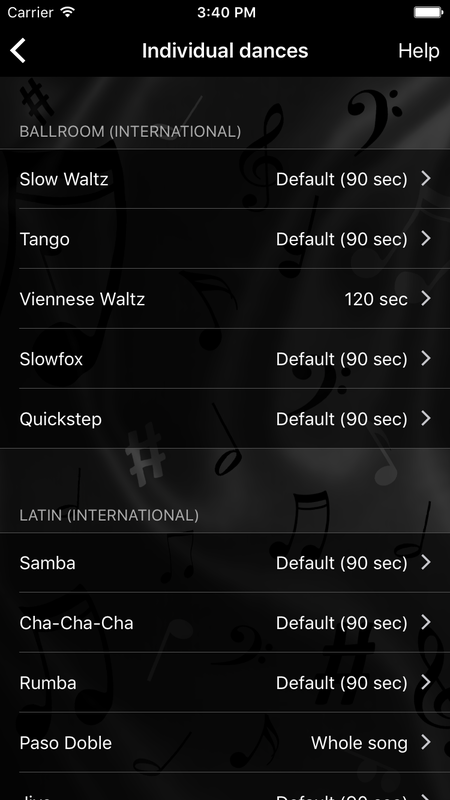 To make sure that even at a higher tempo all dances can be played in full length, set the tempo reserve as high as you intend to increase the tempo. 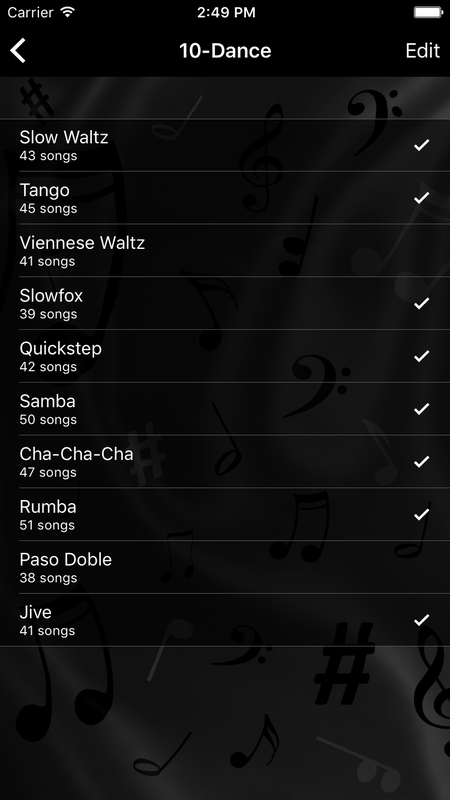 Of course, this narrows down your song repertory, so a combination of high dance length and high tempo reserve might result in only a few playable songs. You don't need to worry about automatic tempo adjustments here. OnTheFloor takes care of that itself. This setting is only about manual tempo changes. Saving option controls whether you can save and load different final round settings. If the current settings are enough for you and you want to skip the screen that lists all saved settings, then select Off here.